Love and hate. Two words with very powerful but different meanings. Describe love and hate. You may use any words to do this. You can use colors, a story, describe the feelings each brings, or anything you think might be useful to help us understand how you view these two words. This entry was posted in Something to think about, Writing and tagged thoughts, words, writing. Bookmark the permalink. Love and Hate are both very strong words. Love can mean many things. It mostly means affectionate feelings you may feel for someone. Love to me is when your paarents are there for their children to wipe their running noses and when a family spends most of their time smiling and enjoying one another’s company. One thing that I love about the word Love is that it is never jealous, boasts, is rude, or puts you down, but it always builds up. Hate, on the other hand, is a strong jealous and rude feeling that you may have about someone else. Hate doesn’t do anything for us so we should learn to LOVE not just ourselves, but one another. there is so many ways you can describe love. you can love someone in the heart. love is a strong word. you can give some body flowers or candy. hate on the other hand is a strong word you can hate someone in a way you dont like. so there are so many ways you can say these words. so get ready to say these cause you are going to hear them in the world some day!!!! Love and hate are very strong words. What is love and what is hate? Love is when you get butterflies in your stomach or when you really care about someone and you’ll do anything for them. Love is never jealous, it is never rude. Hate is something when you feel like you can’t even see the person. You feel red,dark, and just plain evil. You feel like a whole nother person when you hate someone. Hate is very strong feeling that when you feel it, it can get out of control. Love is an emotion . Hate is for the devil . Love is for couples . Hate is for lonley people. Love and hate are two different strong words. Love is like when you have a feeling of happiness or when you really love something/someone. There are so many ways to describe love: love is like an attraction towards someone. Love is never jealous! On the other hand hate is the opposite of love. When you hate someone you don’t love them, you don’t like them, you just cant stand that person. You should alwaysd be careful on when you say you hate someone and also when you truly love someone! Love is an emotion of strong affection and personal attachment. It is a very powerful word. It is often misused. Sometimes people don’t mean it when they say “I Love You”; they say it just to say it or they just THINK they love someone. When you have love for someone, you care about them and want them to be happy no matter what. Hate is to intensely or passionately dislike something or someone. When you hate something you have the feelings of anger and hostility towards it. The word “hate” can also be misused, for example, when a teenager says that they hate their parents, but deep down inside they really love them. Hate is the bade side of you coming ot while your mad . But love is when yiur in a good mood and you want to show it to the whole world. Love is when you feel good inside. Hate is when you get bad feelings and you start to get mad. Some asociate love with pink or purple. And hate with black or red. Love is where you’re happy with whoever it is. It’s a powerful feeling where you feel a great attachment. You care deeply about them , forgive them no matter what it is they have done , wish for their happiness , and many more. Hate is where you despise something. Despising something means that you can’t stand something/someone. Love is a powerful word that a married couple or not even a married couple say to each other. Sometimes they dont mean it but thats what it is used for. Hate is when you just cant stand someone but why use that word you should LOVE everyone in their own special way . You should love NOT hate . love is being happy and nice to everyone. i guess if love was a color it would be yellow or pink. hate is dark and evil and it ruins lives. if hate was a color it would be black or blood red. Love > is when you care very strongly about someone or something . hatte >> is am emotion you fell about some one thats strong ,hats is very diffrent from love. Hate is a devil thing that is inside you. Love is a strong feeling that is spread form family to a friend. For example love is when you have a good time with your family or girlfriend like in valetine’s day!!!. And hate is when enimies grow and become closer. Love is when you TRULY care about someone or something . Not caring and being ignorant. LOVE Is a reallly strong word that and a really strong feeling that in my words.Means that someone is married or going out that has a really strong feeling and really cares a lot of some one or somebody.And HATE is a word that means some one or some body does not like you or hate on you a lot and are always trying to make you sad by saying bad syuff to you that they think might hurt you. Love to me is when someone starts too feel a very strong and certain way about someone. Its also a very great and powerful thing. Hate is something very strong as well. You may not like some one , but to hate them its very wrong and also not right and you should really think about what you say when you say love or hate. LOVE is a powerful word that people use, and don’t truly mean it. When people use this word and don’t mean it, they hurt someone and sometimes don’t realize what an impact they’ve made on someone’s life. You could go from making that person feel special to making them forget who they are. And without that person’s love grows hatred. The only thing is …. at this age some of us don’t realize what love is. The only way you’ll know that someone really love’s you is to look in their eyes and ask the questions. Do you really love me ?? Will you do anything for me ?? But REMEMBER , not everyone means what they say …. amor.. el odio es cuando la jente lo ocasiona cuando se pelea le tiene mucho odio . Do you love me, he gave me no reply. So i ask do you hate, of course i do. the intense bullet that strike my heart stung me for the rest of my life. When you say you love me, my cheek blush and a almost endless smile fill my face. but when you said those striking word to me, i hate you, my endless smile fades away leaving tear marks on my face. So yeah there a major diffence between love an hate, well atleast, emotionaly wise. Love is a heart with an arrow, which feelings are not like no other, like doing anything just to see that person smile everyday.HATE is loathing someone entirely to where you get the feeling that you dont want to hear their name or see their face, and that they will make you sick to your stomach. They are way different from each other. Love and hate are two very strong words. Love to me can be described as a strong and intense feeling someone can have towards another person or something. And hate can be described as a strong disliking for someone or something. Love is a strong intese feeling someone can have towards another person. The color red is like love for me. Hate is a strong dislike on another person. The color black is like hate to me. Love is a strong word its means alot. Love is like loving your family and loving someone special i think love is a good thing i think you should always have love for people and be nice. Love is a good thing to have sometimes it can be complicated but you have to keep loving and love yourself to……. So that you can have a good realtionship……!!!!!!….. Love is a very powerful and passionate word used to describe happiness and passion. Love lives around us. From family to that special someone that catched your eyes and heart from the first look. Love is like a garden full of roses and different colors. On the other hand, hate is completely different. Hate brings that angry feeling inside of you. Hate is what makes enemies grow and friends go. Hate just brings hatred to our souls,and my personal oppinion, it should stop and disapear. Love is the a very stong word for every one. When you think of love ur feeling a weird sensation in you.Love is a meaning of how you feel about something or some one.When your in love act shy or nervous on front of the person you love…Hate is also a strong word .When some one uses the word hate they are either realy mad or just dislike some one or something. Love, to me is like a beautiful red rose filled with life and so much brightness. Love brings smiles to everyones face. Hate is the totally different. For me hate is like a stab in the leg or a kick to the gut…painful and yet kinda stupid. Emotions are emotions but everyone should love not hate. Love and Hate can really touch your heart.Love is when you feel happy with the peron you are with.When hate come sto my mind i think of a person or thing trying to do something bad or cause something horrible to you. Like hate could stand for “red” and love can stand for “white”I really like th eword love when it comes to my mind and i hate hate because I really hate when black and dark thats why I love love. Love and Hate. Two very strong wordsHate is the devil word and saying hate it is like saying you don’t want to deal with someone. love i think of a happy couple, married walking in the park, enjoying each others presence, or on valentines day. i thinkevery one should love one another so that means that if you love you are doing the right and correct thing. Love is when you care enough about a peson to guve them your jacket when their cold,and when you care about someone so much that you give your life just so they can live. Hate is when you hate everything about a person and you could careless about them or their life. When I think of Love I think of Jesus 🙂 . I think of him because he died on the cross for our sins. He did that because he “Loves” us. When I think of hate I think of the Devil >:) . I think of him because he is trying to lead us away from God. 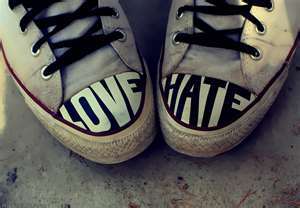 That’s what I think of Love and Hate. Never ask why I love you, just accept that I do, and that I will for the rest of my life. Love is a very STRONG word, it has many meanings to it. Most people just use the word but really dont know the real meaning behind it . Love is being there for someone when no one else would. Hate to dislike passionately . But in reality the more you hate the more your in love. love is a srong and powerful word, it has many meanings to it. Some people just say the word just to say it, but people need to really understand the meaning to it because it really is a strong word and powerful. Love can also hurt people because people just play around with the word and don’t really mean it and it can turn into hate thats why people need to start understanding the real meaning. To me love means serval of things you don’t love your mom the same way you love your wife or girlfreind. when someone says that they hate someone they carry that around expecially when they love you. when someone says the word hate i think of red when someone says love i think of white. love is when you love someone with all your heart. it is also have feeling for a person. love is someone that you would be there for no matter what.hate is when you can’t stand seeing someone or talking to them. when someone does something to you that will hurt your feelings that is HATE!!!! Love tis felling may make someone fell buterflys so to say the felling in your stomich that makes you fell like you can fly away.Hate now this felling is verry diffrent its like that felling that makes you soo mad you just cant stand it anymore that you want to explode..
Love and Hate. Two very strong words. Love is the color of red and it gives you that warm feeling inside of your chest. Hate is the darkness inside of you, with a cold feeling. When you hate it is like you’re heartless. In school, I love social studies, but I hate science. I have a cold and dark feeling for science. These two words are the two strongest words in the world. love and hate poeple can do lots of stuff with that word war can start or poeple can start a new life with the words many can get rich just by saying love or hate many things can happen with thosse to words just by saying love or hate. Love is a four letter word but only one meaning. Love has its ups and downs , smiles and frowns, laughs and pain, the reason why your mind goes insane. And when you put it all together, you believe that its happiness forever. Its just like asking mommy, what is love and then she’ll say you and you’ll feel so sweet , well that’s what we call a little L-O-V-E . Hate is a four letter word but has a horrible meaning. Its when everything goes all the way down hill. Its so ice cold it’ll give you a chill , its so bad its undescibable, but when its around its undeniable. Love is when you care about someone and how they feel about them. It a feeling that your mother gets when she gives you a hug.When a child gets a new toy. When a man and a woman get married and have a new born. Hate is when you dont care about them. You wish they would die. Thinking of them makes you fill up with anger. Love is a good feeling that you have for someone or something about their characteristics. Love can be forever meaning or not long lasting. Hate is when you don’t like anything about the person and sometimes regret even talking to them. Hate can be overuled with foregiveness in someones heart.These are the basic meanings of love and hate. love and hate has to different meaning and love is a strong word that you use and have to mean it when you say it. and hate is a strong word you use when you are mad and you dont mean it. I Brandy go to Edwards Middle School. I love learning about Language Arts and Math,but I hate Social Studies. Learning shouldn’t be boring or hard so to make to easy. You have to love the teachers and not hate them as bad, as you do the students. It doesn’t matter how they look, dress, speak,or color as long as they don’t do anything to you love them and don’t hate. hate is when somebody cant stand you. love is whenyou really care for someone. if you hate someone you would never hang or talk to them forever. if you love somone you would always be there for them. When i think of love i think of a happy couple, married walking in the park, enjoying each others presence, or on valentines day, when the wife comes home from a hard day at work, and the house is red and pink, with roses every where and the all the lights are off, just candle light barely burning showing glossy pink and red scattered everywhere and the smell of a nicely cooked spaghetti emmitting from the kitchen. This is love to me. Wehn i think of hate i think of that one kid lonley in the classroom being descrimitted all alone and sad. Randomly one day of school the kid brings a gun and goes on a mass muder because his entire life he was nobody to lean on nobody to love and the anger has built up to this point of erruption. This is hate to me. I Brandy go to Edwards Middle School. I love a learning about Language Arts and Math,but I hate Social Studies. Learning shouldn’t be boring or hard so to make to easy. You have to love the teachers and not hate them as bad, as you do the students. It doesn’t matter how they look, dress, speak,or color as long as they don’t do anything to you love them and don’t hate. The word hate has diifrent meanings to certain people. Hate to me is a word you say when people make you mad but you really dont mean it. According to the bible every one should love one another so that means that if you love you are doing the right and correct thing. Hate is the devil building within us. It starts out as a little thing that someone does to upset us, and because we don’t deal with it straLove is indeed a complicated subject and to really come to terms with fully I think it can actually be a matter of truly knowing yourself and loving yourself first. When you can do that, then you will be ready to love another, and you will also be able to distinguish love from other profound emotions.